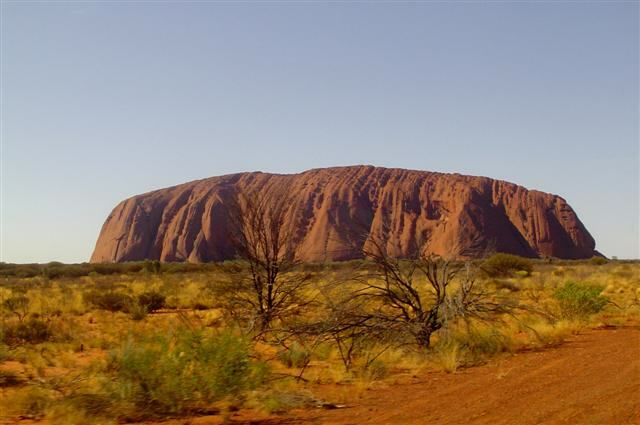 Uluru is synonymous with Australia. Think of one and the other comes to mind. 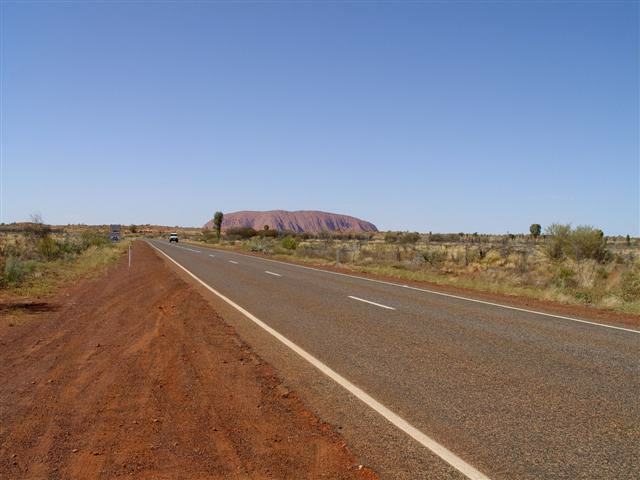 96 kilometres (60 miles) north of the Northern Territory-South Australian border the Stuart Highway intersects the Lasseter Highway, the turn- off to Uluru – Kata Tjuta National Park and Yulara where the Ayers Rock Resort is located. With 244 kilometres (152 miles) to travel before we reached the Resort, we knew we were in for a long day and so after a quick stop for coffee we hit the road again. Along the way we passed through Mt Ebenezer Station, the first Central Australian station to be owned by a person of Aboriginal descent. 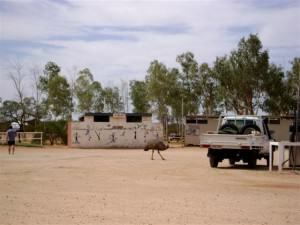 Located 250 kilometres (155 miles) southwest of Alice Springs, the station is one of the few Aboriginal-owned roadhouses in the Northern Territory. Apart from the usual offerings of fuel and meals, the roadhouse boasts an impressive art gallery with a range of local indigenous art. Further along we came to Curtin Springs, 85 kilometres (53 miles) east of the National Park entrance. This looked to be the best place for lunch. A working cattle station, it was founded in 1943 and taken over by the Severin family in 1956. They’ve opened up the homestead as a stop for passing travellers. We found the food prices a little expensive with $13.00 for a hamburger but they are remote out here and freight would have to be factored into their pricing. And, of course, it’s the only place for a hundred kilometres. But what a delightful place! It has camping and motel units as well as the café, takeaway, and fuel, not to mention the acres of green grass, but it was the emus that fascinated me! They wandered around through the parking area and past the fuel bowsers without a care in the world. As you would if you were an emu. They weren’t bothered by cars or people and as long as we didn’t approach them they just went about their business. There were sprinklers watering the lawns the whole time we were there; they must have a terrific bore tapped into the artesian basin that runs under this country. The cattle station is also the location of Mt Connor, a 700-million year old mesa that is 3 times the size of Uluru. It is often called the “forgotten wonder” and the station organises regular tours and bush camps at the base of the mountain. Mt Connor reaches 859 metres (2818 feet) above sea level but only 300 metres (984 feet) is above ground. But Uluru was what we came to see and so after a quick bite to eat we were back on the road. 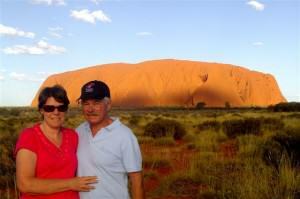 We were still some 50 kilometres (31 miles) from the Ayers Rock Resort when we got our first glimpse of Uluru. How truly spectacular a sight that is! 348 metres (1142 feet) high and 9.4 kilometres (6 miles) around the base, it is the largest single-mass monolith in the world. These figures are impressive enough on their own but it is estimated that at least ⅔ of the monolith lies beneath the surface. I couldn’t wait to see it up close and personal, so to speak. But first we had to settle in at the resort. 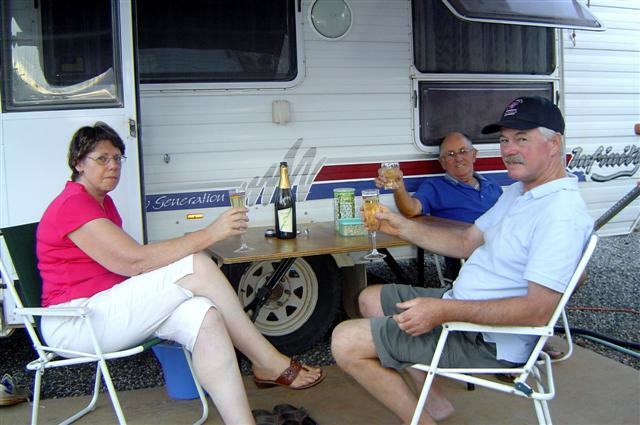 What an amazing place is the Ayers Rock Campground ([star][star][star][star][star_half]) at the Ayers Rock Voyagers Resort at Yulara. It is huge! There are hotels, apartments, a campground, a shopping centre, police station, fire station, medical centre, and a whole lot more that we didn’t see as we drove through the town. We checked in and set about organising the camp before heading off to the local shopping centre. And what a surprise that was! The town might be remote but the folks here are certainly not doing it tough! 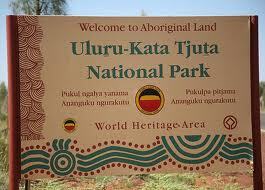 Built to support the tourist industry around Uluru, Yulara was born in 1970 and proclaimed a town in 1976. The weather has been glorious and quite hot during the day although the nights are a little cool. The resort swimming pool is, understandably, a very popular place and we wandered past to check it out on our way to dinner at Gecko’s Café. I might have been tempted to try it out but, after all that travelling, the heat, and such a good meal at dinner, all I wanted was an early night and it wasn’t long before I was tucked up in my bed and fast asleep. There are some days that you know will live in your memory for a very long time, if not for the rest of your life. Our first full day at Uluru was one of those days. When I think of the number pf people who expressed dismay that we wanted to come here I just shake my head. Uluru? Ayers Rock? What do you want to see that for; it’s just a rock. Well, that rock is the most magnificent sight you will ever see. 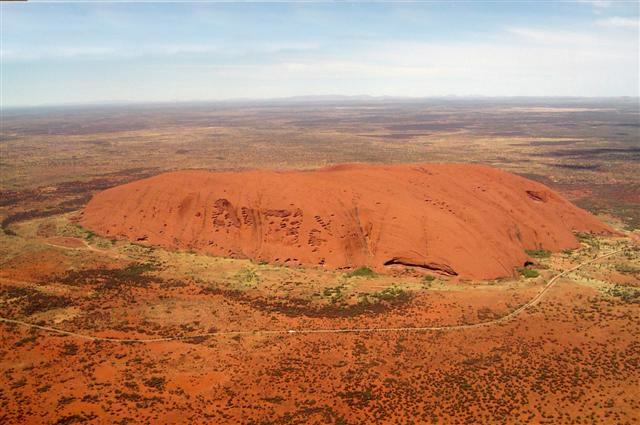 It is not only one of the greatest wonders of the world but is a treasured icon to the local Aboriginal people, the Anangu, traditional owners of Uluru. For both these traditional custodians and the many hundreds of thousands of travellers that flock here, from all over the world, this is the physical and spiritual heart of Australia. We drove out to the National Park in the morning and no matter how many pictures we had seen of Ayers Rock, nothing had prepared us for seeing it for real. We were awe-struck by this astounding sight. You can almost feel its ancient spirit and it’s not hard to understand the depth of feeling that the local Aboriginal people have for Uluru. Uluru can’t be experienced from the confines of a car; it was almost as if we were drawn to the Rock. We took the Kuniya Walk down to the Mutitjulu Waterhole and the caves where we saw rock paintings that were, quite literally, millions of years old. Some of the paintings were amazingly detailed and some had not stood the test of time and for reasons unspoken, the majority of people there tended to speak in hushed whispers, lest they disturb the spirits. Walking around The Rock is an experience that shouldn’t be missed and another one is the climb to the top. The Mali Walk leads to where the Rock climb starts. The climb is physically demanding and it is recommended that if you’re not reasonably fit or if you have any health problems, that you don’t attempt it. 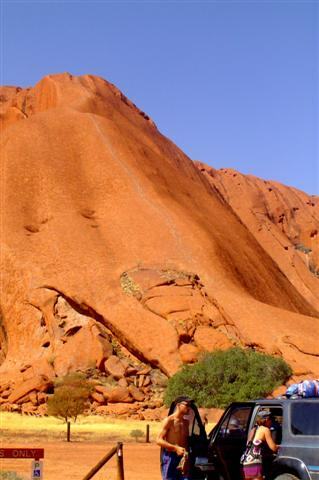 The Anangu ask that people not climb the Rock but, of course, some do. Personally I think they’re crazy – that path is almost vertical and since the climb was first opened some 35 people have died while climbing the Rock. That sort of thing can really put a dampener on your holiday! 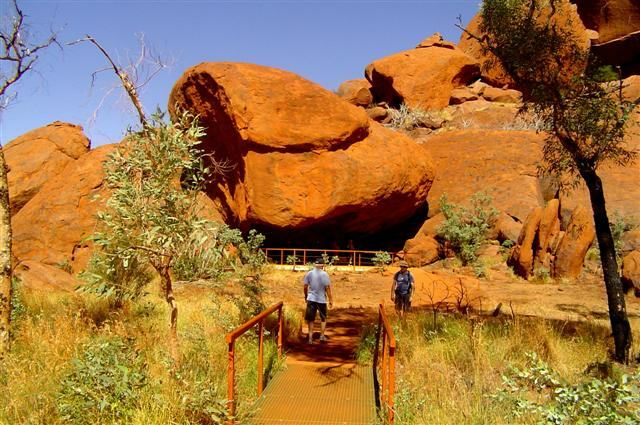 The Uluru-Kata Tjuta Cultural Centre is located at the end of the Liru Walk and there are several cultural and environmental presentations held there. It’s the best place to learn more about the significance of Uluru in Aboriginal culture. We could have spent all day at the Rock and the Cultural Centre but decided to visit Kata Tjuta, The Olgas, and come back to the Rock later. 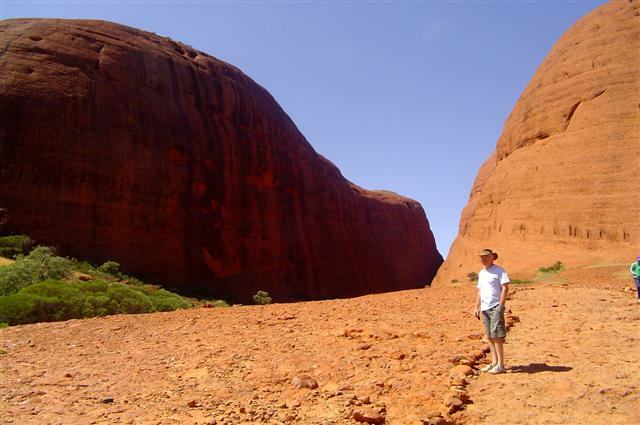 The name “Kata Tjuta” means “Many Heads”. 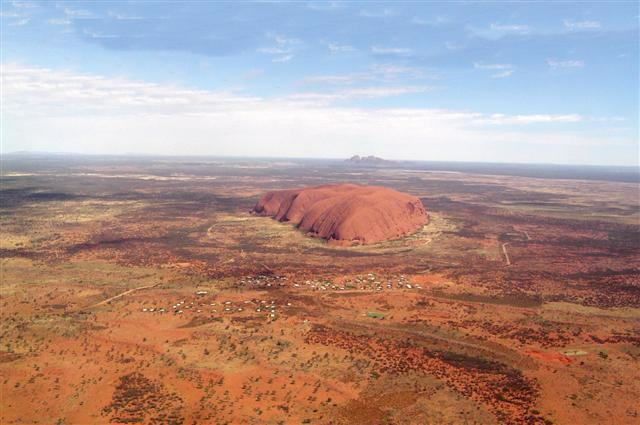 The 36 steep-sided domes are approximately 32 kilometres (20 miles) west of Uluru and along the way we passed the road to Kaltukatjara and the Western Australian border. 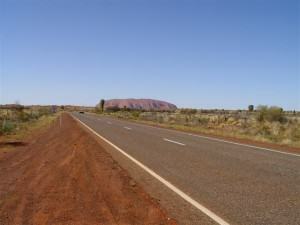 This is all Aboriginal land and to travel that road requires a permit. that it would be disrespectful for me to continue. In fact, Kata Tjuta is sacred to the Anangu men and Traditional Law is still learnt and passed on today. Under these laws, detailed knowledge of the area is restricted to certain people within the tribe. The name is pronounced ‘warl-pa’ and it means wind. Throughout the gorge there are many rare plants, some of which occur nowhere else in the world. John decided to go further along the rocky track into the gorge but he didn’t walk all the way to the end; it was a very hot day and he had no drinking water with him but he did go some distance into the gorge where it was definitely cooler in the shadows of this gigantic rock formation. shining directly on the face of the Rock and so we didn’t see any of that deep rich red colour. In fact, for us it was a little insipid. Not that that made any difference; just being there was all that mattered. There was quite a crowd gathered at each of the viewing points, many with their folding chairs and snacks, prepared to stay until the very last rays of the sun faded from the sky. The Uluru sunset is known throughout the world as one of the most spectacular sundowns that you will ever see and the National Parks Service has made sure that there are plenty of vantage points. Even tour operators arrive with busloads of eager sightseers and the cacophony created by thousands of cameras clicking and whirring was enough to even drive the insects away! We left the viewing area before the sun had completely set and returned to camp to settle in with our bottle of Two Tails Sparkling Wine for our “first night” ritual. This had been a fantastic day and, yes, it will long live in my memory as one of the most amazing and moving experiences of my life. Little did we know that the best was yet to come. climbing to our cruising altitude of 1220 metres (4000 feet). 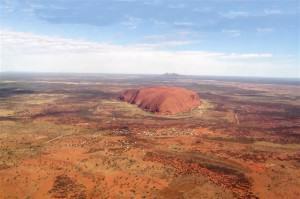 Uluru is even more magnificent from the air than it is at ground level. We flew right around the Rock and photographed it from every conceivable angle, and even a few inconceivable ones. We could see some climbers but didn’t get too close; the last thing we wanted to do was startle someone. Although, John jokingly suggested that we buzz them and the pilot, not so jokingly, suggested that John might like to walk home! We overflew the Resort and had a close-up look at the exclusive executive tent resort where celebrities, including Nicole Kidman and Keith Urban, are reputed to stay from time to time. And this was as close as we were ever likely to get; there are security guards and fences to ensure that no one gets in uninvited. Obviously celebrities, in spite of their public persona, need their privacy too. In the distance we could see the Olgas and behind us was Mt Connor. At a certain angle the Olgas, the Rock, and Mt Connor are all in a straight line giving credence to the theory that they were all part of an undersea mountain range millions of years ago, long before the water dried up. 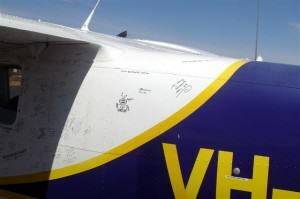 Our names on the aircraft! Flights with a memento of our visit and, of course, we posed for the obligatory photograph with the plane before thanking Josh for a great flight, brilliant commentary, and a very smooth landing. It was late that afternoon when we returned to camp and John and I went for a walk up to the Naninga Lookout. Our stay was over for we were leaving the next morning but we simply could not leave without one more look at this magnificent rock. I can well understand why some people make the trek here many times; the powerful spiritual presence that is Uluru seeps into your soul. I know we’ll be back someday, I feel it in my bones.